Love is all around.... or at least Hearts are all around the shops at this time of year - but hearts can be found in abundance in the natural world all year round. I spent a chilly hour meandering around my local National Trust property Morden Hall Park and my time was consumed by peering at tree bark, squinting at the clouds, gazing in icy puddles and scrabbling around in the vegetation. It undoubtedly made me stop and look closer at my surroundings than I ever normally do. As a botanist, I was unsurprisingly drawn to leaves more often than anything else. Are you ready for a bit of botany? 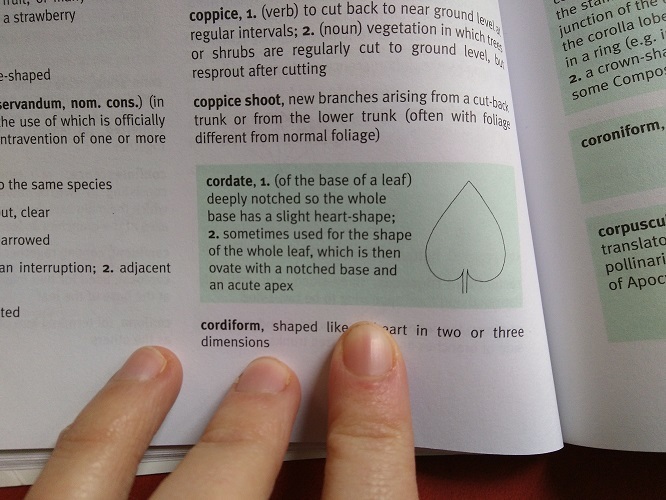 The word botanists use to describe this shape of leaf is cordate. The Kew Plant Glossary, an illustrated dictionary of plant terms by Henk Beentje and Juliet Williamson. A treasure hunt for different shapes in nature is a great way to get you looking more carefully at the world around you, not just for children! Pollia condensata berries. Photo by Juliano Costa from WIkimedia Commons. Shared under a Creative Commons Lisence. The blue colours that we usually see in nature- in flowers like delphniums, bluebells and agapanthus, and in fruits like blueberries, are caused by pigments called anthocyanins. These compounds are also responsible for the pinks and purples like those found in beetroot and red cabbage. Pigments (including those that we use to paint with) absorb certain wavelengths of light. The wavelengths that are not absorbed by the pigments are the colours that we see. In the case of these African Pollia berries, there are no pigments at all present in the berry! The appearance is entirely due to something called structural colour. This means it is the physical structure in the cells of the berries that causes the colour that we see. In the case of this berry, there are spirals of cellulose microfibrils which bounce back the reflected light in a certain way. Because the colour is caused by a physical structure, rather than an organic pigment which degrades over time, the intense blue colour of these berries persists while the green pigments in the leaves and stalks fades. The image below is from a herbarium specimen from the collections at the Royal Botanic Gardens, Edinburgh. 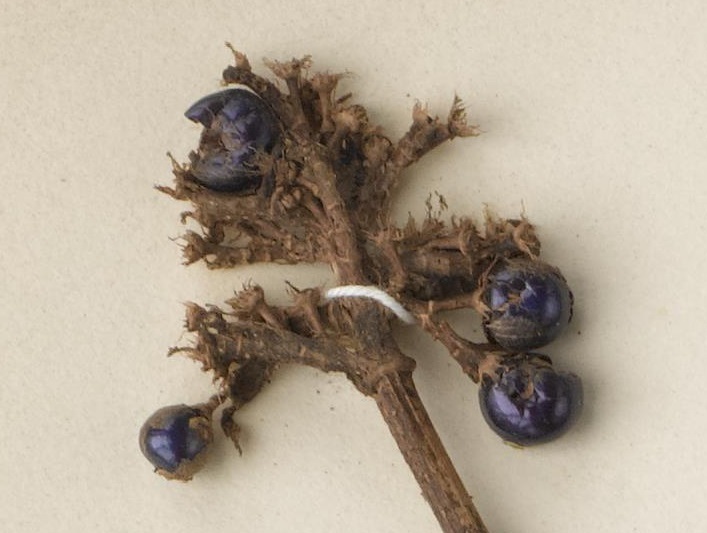 The berries on this specimen are about 5mm in size and retain their metallic blue appearance which is caused by structural colour rather than pigment. A herbarium specimen is a dried and pressed plant that is mounted on paper alongside a label detailing where and when the plant was collected. Herbaria around the world have millions of these specimens available for scientific study. If we take a closer look at the label on this herbarium specimen, we can see that it was collected in Cameroon in September 1895. Thats over 120 years ago! Although uncommon, this phenomenon is not unique in the natural world - it is more usually found in butterflies and beetles. I'm not sure I would know where to start if I were to paint these glorious little jewel like fruits, but here is a wonderful example of structural colour from a creature of the entomological world by the wonderful Natural History Illustrator Lizzie Harper. Fibonacci spirals can be found everywhere in nature from sunflower seed heads to pine cone scales, succulent leaves, cacti spines and many many more. This video illustrates it beautifully. Take a few minutes out of your day to watch it - you won't regret it! Here are a few pictures from my archives of illustrations showing fibonacci spirals. The apples in my garden are looking rosy and should be ready to eat in a few weeks, but this piece is an illustration of the native wild apple, or crab apple - Malus sylvestris. I've shown as many aspects of its lifecycle as possible to give you a full impression of its character throughout the seasons. I hope you like it! This involved many sketches, specimens, photos and dissections to try and capture all the different parts of the plant that I wanted to include in the final piece. The main difference between the cultivated apple and this wild relative are that the crab apple fruits are smaller and more bitter. All from the little track alongside my house. Although this is an 'autumn composition' they are all still going strong now, at the end of January. The hawthorne has never been out of leaf - the new leaves were sprouting before the old ones had dropped. What a crazy mild winter it's been! A 'library page' of sycamore seeds which have whirled their merry way to the path outside my house. We are coming to the end of the first painting module of the diploma course and this was an exercise in textural repetition. I've put up an image of the whole sheet so you can see my notes on colours etc. in case you are interested in that sort of thing. Cones always seem a bit daunting to me with all their fibonacci spirals but I'm enjoying these far more than trying to get veins on leaves looking right at the moment. I've been practising mixing different greens, so some nice green leaves are the obvious thing to paint. The Camelia bush has lots of pink buds, ready to burst open when the weather warms up a bit. This pine cone has been lying around the house gathering dust for ages, so I thought it was time I drew it. I don't know what species of tree it came from. Pine cones, like pineapples, sunflowers, corn on the cob, and countless other natural objects, show fibonacci spirals in their structure. Its tricky to get it right, and I had to resort to putting little coloured stickers on the scales so I could follow the spirals round without getting confused. I posted a pencil sketch of the pitcher plant that sits on my kitchen windowsill last year, but now I've had another go at it in coloured pencil. We were at Hampton Court Flower Show a couple of weeks ago and saw some amazing pitcher plants on display, which reminded me of this article about the Giant Montane Pitcher which acquires its nutrients in an unusual way (unusual even for a carnivorous plant). Its well worth a read. Its almost a month since I returned from Edinburgh, where I spent two fabulous weeks at the botanic gardens for the intensive teaching block of the first year of the diploma in botanical illustration. It was a lovely bunch of people, with fantastically talented tutors, in a beautiful place. I can't wait to go back again next year! At the weekend I painted one of the little fruitlets. Hopefully this year will be a good pear crop! I've just finished off a study page of daffodil bits: whole plant, flower longitudinal dissection, pod, transverse section of pod, bulb and roots, and dissection of bulb. I love cutting plants up to see how they look inside. In other news, I got an email this week to say I had been offered a place on the RBGE blended learning Diploma in Botanical Illustration. I'm more than a little bit terrified but also very very excited! We start with a two week intensive block of teaching at the botanic gardens in Edinburgh in June. I've been ordering paints from the materials list, booking trains and finding somewhere to stay in Edinburgh and I can't wait to get started. Hopefully this will be my motivation to blog more regularly - I'll try and post about how the course is going, and what I'm working on. Exciting times! Stay tuned! This is the picture I've been working on. The plant is done in graphite, the tomato dissections and flowers in watercolour, and there is also a cross section of the flower. I thought you might like to have a little peek at my drawing desk, and also a little preview of what I have been working on this week. I'll share that work with you in more detail later on. My desk is in a lovely little cubby hole and my wonderful daylight lamp makes working in the evening and during winter much easier. What you can't see in this photo is the postcards which I have along the left hand side, showing inspiring pieces of botanical art. The most recent ones I have there are Rachel Peddder-Smith's Herbarium Specimen Painting. Here is a quick sketch I did while travelling in Kenya over New Year. Its a pod from a tree that was growing in the grounds of the place we stayed near Mombasa. When a botanist discovers a new species of plant, they must publish a description in scientific literature. Earlier this year I was asked by Alex Monro at the Natural History Museum to illustrate three new species of Pilea for a paper he was publishing describing these new species. This paper has just been published in the journal Phytokeys and you can see my illustrations for the very first time in a real scientific journal! The full article can be found here. I learned a huge amount doing these illustrations. I worked from dry herbarium specimens and used a dissecting microscope to see the smallest details. The flowers of these species are tiny - just a few mm across, and I had to boil the dried flowers in water so that they would open up so that I could see their structures. These aren't the most obviously pretty plants, but seeing the microscopic features of a plant is always fascinating. I'm looking forward to doing more illustrations in 2013, and will try and post as often as I can to share what I am working on. Its not botanical illustration but it is crafty and botanical so I thought I would share this here. A few months ago I won this Sunography kit as part of a goody bag at the Wildlife photographer of the Year Exhibition at the Natural History Museum. With a sunny afternoon and not much else to do I decided to have a go. The kit consists of 6 small pieces of light sensitive fabric. The idea is to use any objects to create a pattern on the fabric by leaving it in bright sunlight for 15 minutes. When you wash the fabric in cold water the areas that were exposed to sunlight change colour leaving a silhouette of the object on the fabric. I picked various bits and pieces from the garden. The picture on the left shows the fabric as it is being developed and on the right the finished image. I did all six pieces of fabric that were included but a couple of them didn't turn out very well. I chose the best four pieces and sewed them together to make a panel to hang on the wall. This is for Paul's study wall. The structure is based on a postcard from Kew showing the evolution of plants based on the APG III classification system.